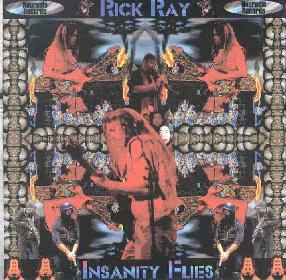 Rick Ray - "Insanity Flies"
Last issue I profiled Rick Ray pretty extensively, diving headlong into his entire catalog. And I was pleased to have had the opportunity to see him perform live so shortly after this immersion into his recorded works (see Strange Daze festival coverage this issue). The volume of Rick's output over the past couple years has been nothing short of phenomenal, and Insanity Flies is another fine addition to his roster of impressive heavy progressive rock recordings. The album is in no way short on Rick's fiery guitar pyrotechnics. But it's also one of the more quietly melodic of his recent CD's. I even hear more acoustic guitar than usual. Among the highlight tracks is "Guitartichoke". With a title like that you know this is going to be one of Rick's shred tunes, and indeed it is. But it's also a primo example of the expressive beauty of Rick's playing. The music rocks hard, but rather than aggression we hear melodic passion that's blazing, but still caressing of the fretboard. If you've read my past reviews of Rick's music than you'll know that an important element of his trademark sound is the combination of the guitar and Rick Schultz's clarinet, and "They've Created A Monster" is one of the hotter guitar/clarinet tracks on the album. Give this a listen and your conception of wind instruments will be forever altered. Another interesting track that features Rick Schultz prominently is "Eyes, Lies And Spies", which has strong jazz-rock influences, but is also one of the most intricately arranged tracks I've heard on any of Rick Ray's releases. I even hear traces of Soft Machine. It's recognizably Rick Ray, but at the same time very different from most of what I've heard from him before. Also a little different is the short closing track, "Nothing Is Right", an ambient guitar and synth piece that utilizes a technique (loops?) that results in these very cool sharp attack notes. Great stuff. And there's plenty more to digest across the album's 12 tracks. Equally heavy are Rick's lyrics, which reflect his concerns with current events and their relationship to the prophecies in the Book Of Revelations. In fact, Rick may well be rock ‘n roll's most reliable newscaster, already having an album out that deals with the terrorist events of September 11th ("Beyond Belief", "Insanity Flies"). In summary, Rick Ray is, for this listener, one the very best guitarists around, combining stunning instrumental proficiency with an artistry of expression that transforms a style that would typically provoke head-banging into a mind-bending voyage of the spirit. This is a guy I can recommend equally to fans of Robin Trower, Steve Morse, and Steve Hackett. Having heard so much of Rick's music in a short time it's really hard for me to decide the best place for newcomers to start. Just check him out.